CTA Classroom: Let There Be Light. Or Not. Everybody knows that the purpose of lighting in the church is to put light on the stage, right? 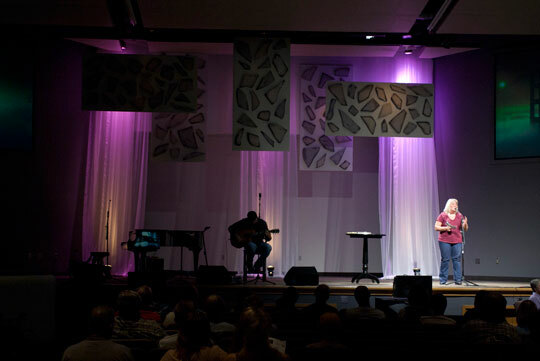 I know a lighting director (from my high school musical days) who said his rule of thumb for stage lighting is to, "flood the stage, and make 'em pink" Over the years, I've seen a lot of churches follow the same advice. I'm not sure that's the best use of light, however. In fact, I would argue that the most creative and effective lighting I have seen includes as much non-light as light. Let me explain. As humans, our eyes are pre-programmed to jump to the brightest thing in our field of view. Try it out for yourself. In a darkened room, with one or two sources of light (the living room at night with a tv on works well), drop your gaze to the floor, then look up. See where your eyes go. More likely than not, they darted to the lightest thing in the room. In my living room right now, when I look up I see the tv. So if our eyes are drawn to the brightest thing in the room, what else is drawn there as well? Our attention. Now think about what happens when you wash the entire stage with bright, even light. Where does one look? I would suggest that when the entire stage is lit evenly, the people in the congregation don't know where to look. 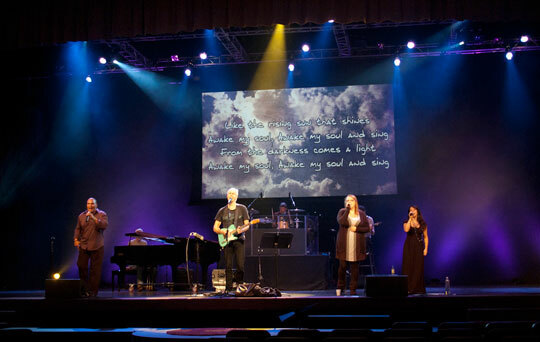 What if we as lighting designers could help direct the congregations attention where we want? Guess what? We can! We do it by using shadows and the absence of light. So if you have a worship set on stage, you typically want the worship leader to be where people are looking. To accomplish that, you can light the rest of the band with richer colors and less overall light, and put a little more light on the leader. If the guitar player has a solo for a bridge, bring a light up on him or her. That shifts the focus of the audience where you want it to go. You can also apply this to the pastor who is speaking during his message. Consider a stage that is fully lit during the message. The poor person in the congregation doesn't know where to look. Strike that, they know where to look, but their internal hardwiring has them looking all over the place for the brightest object. By dimming upstage and stage left and right and putting the speaker in a nice pool of light (large enough for him to walk around if that's what he does) the man in the pew's attention is automatically drawn to the speaker. He'll spend more time listening and less time looking around. All we're doing is using the body's natural tendencies to draw attention where we want it. In doing so, the congregation spends fewer "processing cycles" to use a computer analogy, trying to decide what to look at, which frees them up to hear the message. And that's what it's all about. The church technician's primary job is to support what happens on stage, remove barriers to receiving the message and to enhance the experience. Everything we do boils down to that. By using light and the lack thereof, we make progress in all three areas. Now go have fun lighting - or not!